Now it’s your turn to see what we did. 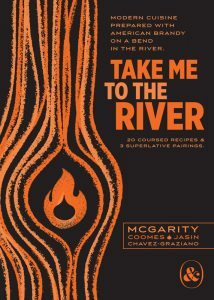 The book’s name, “Take Me to the River,” is a bit of a double entendre dreamed up by Heron, an unabashed rock music enthusiast. Some know of Al Green’s deliciously bluesy original recorded in 1974, but likely most are more familiar with the Talking Head’s spectacularly quirky remake done five years later. The latter tune, Heron says, is a funky and fitting tribute to Louisville, the river-side city which he and wife, Lesley, have called home for several years. The book (click here to get your copy or get it at Copper & Kings’ distillery souvenir shop) features Copper & Kings’ aged American Craft Brandy, Floodwall Apple Brandy and Butchertown Reserve Casks Brandy in recipes ranging from amuses, soups and salads through appetizers and entrées. All dishes were developed and prepared by McGarity at the Portage House kitchen over two days of shooting. Since opening almost four years ago, Copper & Kings has worked closely with U.S. bartenders to develop a solid presence in cocktails. But according to Jasin, the brand saw an opportunity to inspire chefs to cook with its spirits. McGarity’s ease with using brandy as an ingredient, I must add, impressed us both—and the dishes he wrought with kept us full over those two shoots. McGarity—who wins the award for “Most Organized Chef I’ve Worked With On a Photo Shoot”—believes his peers who use the book will immediately recognize brandy’s versatility. Home cooks: These recipes were created for your use as well. Instructions are clear and methodical, plus McGarity avoided complex techniques that would have made them inaccessible. Besides organizing the project, I created a three-country-ham and brandy pairing, in addition to collaborating with Chavez-Graziano on a second paring featuring her chocolates and multiple cheeses. The point of both pairings was to show chefs and home entertainers how easy it is to create dazzling flavors by doing little more than procuring the right ingredients and matching them with good spirits. 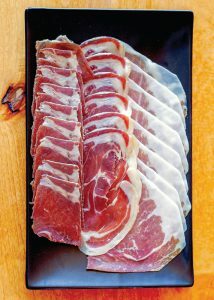 Country ham sliced paper thin goes especially well with brandy. Two other benefits: The book is gorgeous—thanks to Jasin’s photography and McGarity’s and Chavez-Graziano’s edible art—and its compact; barely larger than pocket size, and easy to handle while you’re making the recipes within. Enjoy reading it—with a pour of brandy or a cocktail at hand, of course. Cook with it just to learn how to use some new spirits and unique ingredients. And after you’ve enjoyed it some, thank the providers of the food and drink in this book. While books require the likes of me and Jasin to knit the words and static images together, the distillers, chefs and chocolatiers behind it all are the real heroes of this little story.